Haha I love that book "The Art of Manliness" - definitely something to keep in mind! This came at the perfect time! Need to order my vday gifts. I love that mug! Great suggestions! ♥ I'm in need of some ideas myself. 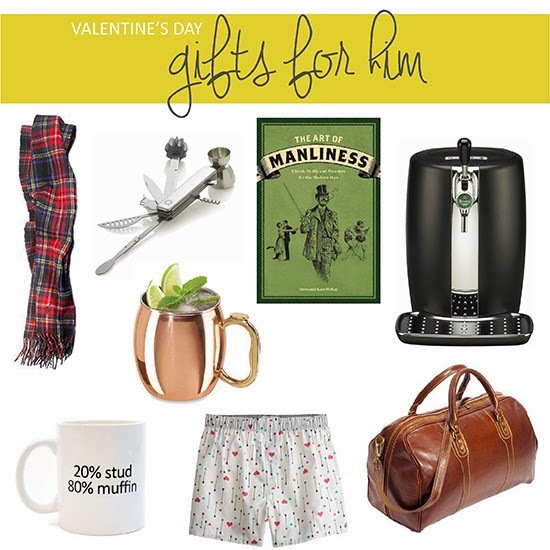 :) I love the Moscow Mule Mug and the Manliness book. posts which consists of lots of valuable facts, thanks for providing such information. Such an amazing round-up.In the event that style,looks and delightful Italian craftsmanship are top of your man's wish list with regards to acquiring a weekender travel bag,this Cenzo duffle bag is absolutely worth consideration.Crafted from the finest Italian calf-skin calfskin this shocking weekender travel bag looks as though it may have quite recently stepped off the feline stroll in Paris or Milan.